(1) I’ve linked a couple of times to Radley Balko’s excellent piece on the disparity in reviews of the Cohan book. In light of the Times’ decision to run a second(!) glowing review of a book that basically mirrors the thesis of the paper’s own flawed reporting, the Balko piece is worth another look. (2) A few commenters have (correctly) noted that Cohan has stayed away from any conservative media appearances. But, as Balko noted about reviews, the issue is less ideological than basic competence. Cohan has received one interview from a journalist who actually knew something about the case—Frank Stasio, of WUNC’s “State of Things.” Stasio didn’t do much in terms of follow-ups, but he asked detailed, well-researched questions, and he pressed Cohan particularly hard on the author’s apologia for prosecutorial misconduct. Cohan floundered in response. I strongly recommend another listen to Stasio’s interview, especially the final nine minutes. (3) I’ll have a fisk of Cohan’s latest press appearance on Monday, but did two long ones this week, one tracing Cohan’s appearance on C-SPAN, the second with New York. In both appearances, Cohan demonstrated an ability to be fast and loose with the facts that would have made his protagonist, Mike Nifong, blush. (4) For those who missed it, Stuart Taylor’s 40-minute interview on C-SPAN, discussing the Cohan thesis. Stuart broke some news, as well: citing a very reliable source, he reported that the individual settlements were $6.7 million, not (as Cohan has claimed, citing “the consensus around Duke and Durham”) $20 million. Since he has been wrong on so much else, it’s not surprising to see Cohan wrong on the settlement total, as well. What is it about liberals that they need to blatantly lie about this case? I don't understand this. It is truly reprehensible what they are attempting to persecute these three Duke athletes again! Can someone please clue me in on what drives this disgusting liberal mindset? To any clear thinking adult this is easy right from wrong with all the facts known. Well, I'm a fairly liberal Democrat. So too, I suspect, is Frank Stasio. anonymous, The first Duke faculty member to defend the three players publicly, Steven Baldwin, is a liberal. The last several paragraphs of Radley Balko's article are relevant to the issue of political views and this case. Is there a link to Balko ' article? It seems to me this is one "issue" that liberals could easily be on the same side of. Other than Professor Johnson and this blog, I see very little liberal commentary unless it's praising Mr. Cohan. That's sad, and though I'm on the conservative side of the spectrum, all praise to Dr. Johnson and Stuart Taylor. Thank-you! 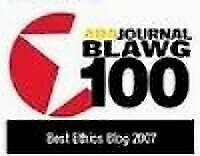 I have read the pointers and all the excellent commentary on this blog and I fully agree. I have concluded some time ago that KC is a remarkable individual. And I continue to be deeply impressed! Note: I have followed this blog for years. But again my quest for "reason" is not satisfied. ...maybe because the responders self identify as liberals (I sincerely begin to doubt that you are, if Cohen, 88, etc represent the way you are expected to think and behave). Looking now at Cohan, and to this day the 88 and the book reviewer friends and the media enablers (NYTimes etc), I am sincerely dumbfounded by their blatant actions that ALL can see are clearly false and only serve to hurt others. I have no other way to describe them, but as truly pathetic sadistic scum of the earth. But still the question is Why:? On another note: If I were "magically in charge of the liberals" I would kick them out of the club ...so to speak. They are severely damaging your brand. Funny how their research projects, based on the titles, are indistunguishable from Alan Sokal hoaxes. Many thanks for the discussion (although it seems I have done most of the talking). Maybe sometime a liberal can "post" why? As someone looking for honest and decent politicians, from either party, I am certainly learning that you can't trust a liberal with the truth ...and its likely that today the right is better than then left (not that either is a panacea). FWIW, I've said my piece. Other than reading DiW blog and a few somewhat similar web sites, I'm pretty ignorant of what goes on in much of academia these days (I graduated a long time ago). Thus I had to look up and inform myself on the Alan Sokal hoaxes. So I say thanks for the spot-on reference. If you hadn't done that, I would have probably thought I was reading an article from "The Onion". Stuart Taylor appeared at Duke on 2 November 2007. My summary of some of what he said: "When he was asked what would constitute due diligence on the part of the parents sending their children to college, Mr. Taylor suggested that they should discourage their sons and daughters from taking classes from far left professors in the humanities. He clarified his comments by saying that the far left professors were not liberal, but subscribed to Marxism or fascism." I interviewed chemistry professor Steven Baldwin shortly thereafter: "In the fall of 2006 Professor Baldwin wrote an op-ed piece for the Duke Chronicle in which he said that he treated his students much as he did his children. Professor Baldwin made clear his judgment that many among the Duke faculty and administration had grievously let the lacrosse players down in this regard. Duke “didn’t stand behind the kids.” Professor Baldwin indicated that Duke should have acted in loco parentis but failed. Professor Baldwin took some of his fellow faculty members to task for savaging the reputations of particular lacrosse players in public, (he said he is still upset over it). Toward the end of his commentary he wrote that these faculty members deserved to be tarred and feathered, and ridden out of town on a rail. Other than from a few members of the group of 88, Baldwin received much support for the main thrust of his essay, support that continued for some time in the form of emails from various individuals. However, the issue Professor Baldwin’s choice of words sidetracked the discussion of how a university should treat its students who are under a legal cloud. The director of Women’s studies, Professor Robyn Wiegman, said that Baldwin’s words were the language of lynching (many strongly dispute this connotation). In addition, a group of faculty went to President Brodhead to ask that Professor Baldwin be fired. Being tenured, Professor Baldwin did not fear for his job, but he wished to turn attention away from himself and back to the plight of the students. He said to Provost Peter Lang that he would be happy to apologize, and Provost Lang thought doing so would be helpful. 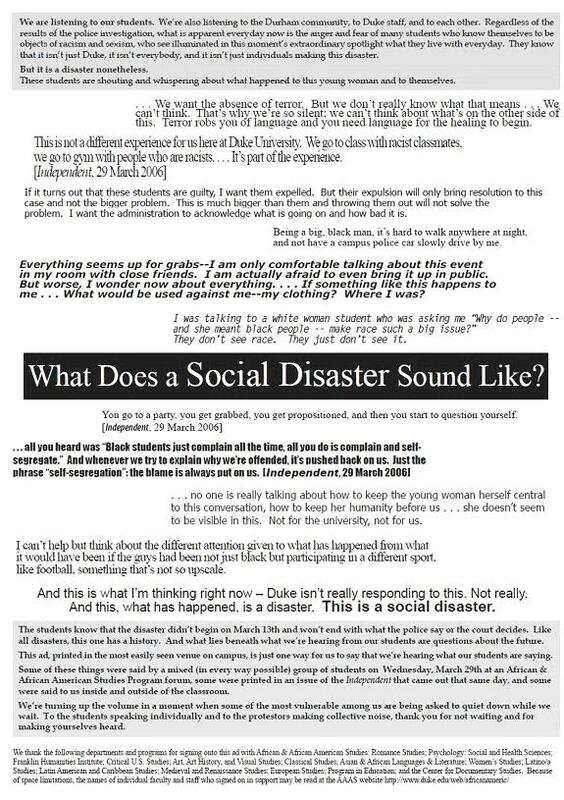 Subsequently, Professor Baldwin wrote a letter to the Duke Chronicle in which he offered apologies for his choice of words, and this had the effect of calming the furor. Professor Baldwin identifies himself as a liberal Democrat but said that this affair has made him a little more conservative. He explained that most individuals in academia are politically correct in terms of not using insensitive language and similar things." I was a liberal for a long time. I ceased being one years before the Duke Lacrosse Affair. That so many liberals in the MSM, academia, politics, and elsewhere jumped on the story and proclaimed the Duke students guilty despite the (lack of) evidence confirmed my decision. So far as I can find out, not a single member of the Duke faculty publicly supported Prof Baldwin's (Chemistry dept, I believe) criticism of the Duke faculty who had attacked their own students. Btw, "tar and feathering" is a time-honored means of inflicting humiliating punishment on someone WITHOUT killing them. It was used in Europe for centuries prior to the American Revolution, in pre-revoluton America, and in the West for that purpose. There were some Blacks tarred and feathered in Vicksburg, Mississippi, prior to WWI. They were not lynched. As I say, this punishment was specifically intended to humiliate someone and force them to conform their behavior WITHOUT killing them. That is to say,it was not historically associated with "lynching", so it is not the "language of lynching". Also btw, the tar that was used was pine tar, which did not require heat to be sticky. Obviously, coal tar, because of its high melting point, would cause serious burns. I was just reporting on what Robyn Wiegman had said. Obviously I didn't agree with it. I had a chance to meet Dr. Baldwin professionally some years later, and I found him to be intelligent and compassionate. As far as I know, no one from the faculty supported Professor Baldwin, and it was not until January of 2007 that some of the Economics professors wrote in support of the players. A robber, moreover, convicted of theft, shall be shorn like a hired fighter, and boiling tar shall be poured over his head, and feathers from a cushion shall be shaken out over his head,-so that he may be publicly known; and at the first land where the ships put in he shall be cast on shore. It seems the truth is more important to KC Johnson than being a liberal Democrat. Yes, those were the Good Old Days of the Middle Ages. By the 17th Century in America, we had adopted a kinder, gentler way to tar and feather someone. I am not sure about liberal/conservative angle on all this, but I completely understand Cohan's angle. He is probably trying to send a kid to Duke and needs the cash. As I and others have pointed out, his story only plays to people who have no knowledge of the case, and only plays if Nifong is a martyr. This is the only case I can think of in this country of a wrongful accusation or conviction in which some from the left sided with authority and some from the right sides with the accused. Both Nicholas Kristof (liberal?) and Peter Applebome (liberal) were sympathetic to the players. For these reasons among others, I am not convinced that liberals are more prone to follow the preferred narrative than are conservatives, with respect to issues of criminal justice. Cohan: “I Certainly Feel Sorry for Mike Nifong"
New Evidence from Karen R. Long? Hard-Hitting Journalism from "Morning Joe"
Durham News: Cohan Book "Fiction"